I've recently had a number of calls concerning an increasing amount of leaf blotch on strawberry. This makes sense, since we've had continuing rains and the subsequent lengthy periods of free moisture coupled with the warming weather ideal for propogation of this pathogen. For those unfamiliar with this disease, it is caused by the fungal pathogen Zythia fragaraiae. 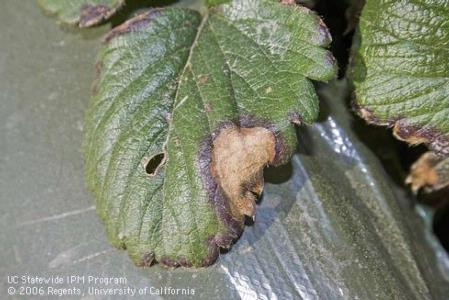 The disease appears as tan to gray blotches often occurring at the margins of the leaves, and one tends to see more disease on the older leaves than the younger ones. The blotches are irregular in shape and can cover pretty well the whole leaf and spread to the fruit calyces in advanced cases. A diagnostic feature of the disease are tiny brown to black fruiting bodies nestled within the blotches. These are the fruiting bodies of the pathogen which produce the spores to spread the disease around. The call has always been that this is a minor disease, and not worthy of taking any action beyond keeping an eye on it. Personally, outside of minor marketable fruit loss to the unsightly brown calyces, I have yet to see major plant damage, much less total plant loss to this pathogen. That is not to say that it won't happen, and our new small fruit plant pathologist Akif Eskalen asks that I mention here how a minor disease could get to be a major issue when the right environmental conditions come up, that is to say, this year. I couldn't agree more with Akif that the problem of leaf blotch could someday and sometime be serious, so we are developing a competence on it. Akif already has a bunch of Zythia samples that I sent to his laboratory for fungicide sensitivity analysis (in other words which materials offer promise and which ones don't). Currently he has them ID'd by DNA analysis and will soon proceed to test them. So, while I still would not be overly concerned about Zythia on strawberry right now, it nevertheless serves our purposes to be ready should it ever be a problem. And that is exactly what we are doing. Leaf blotch caused by Zythia fragariae in strawberry. Note the purple margin on the edge of the blotch. Here's a photo submitted by reader Ted Swartzbaugh down in Ventura county of something you don't see too often. Powdery mildew in raspberry which has advanced to the fruit, and if you look close you can even see evidence of the disease on the petiole. 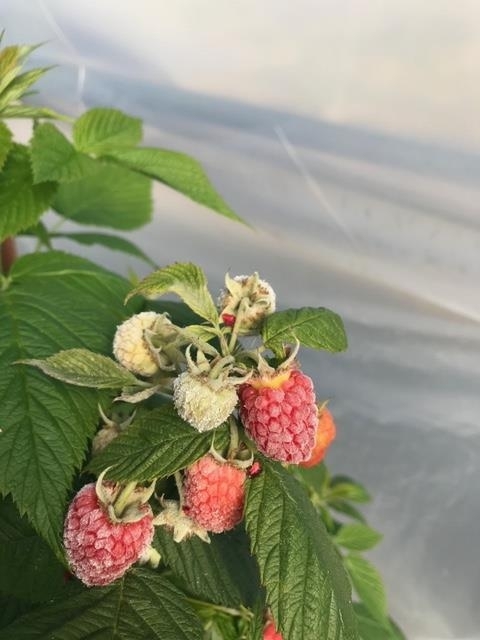 In the way of reminder, powdery mildew in raspberries (and blackberries for that matter), is favored by the warm and dry conditions of the macrotunnels so much in use these days. If you want to know more information on how to manage this one, the UC IPM guidelines are just one click away! Many thanks to Ted for sharing this picture and his knowledge on the situation. Powdery mildew advancing upon a raspberry fruit. Notice the evidence of disease on the petiole. Photo courtesy Ted Swartzbaugh. 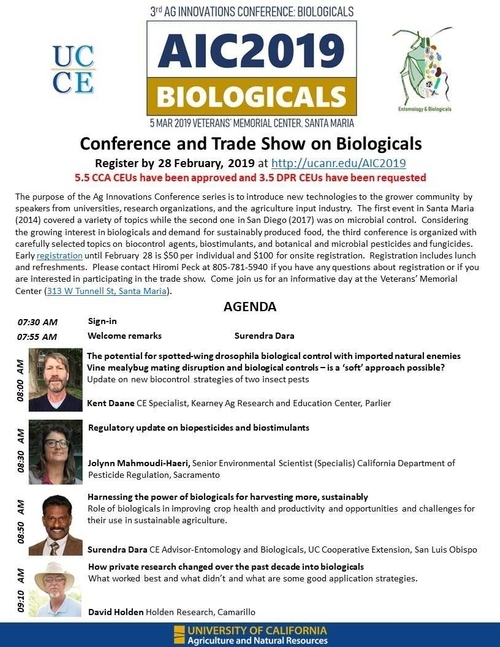 Pretty interesting conference on biological control cooking for March 5 in Santa Maria overseen by colleague Farm Advisor Surendra Dara. I was invited too, but had to decline because of conflicts. 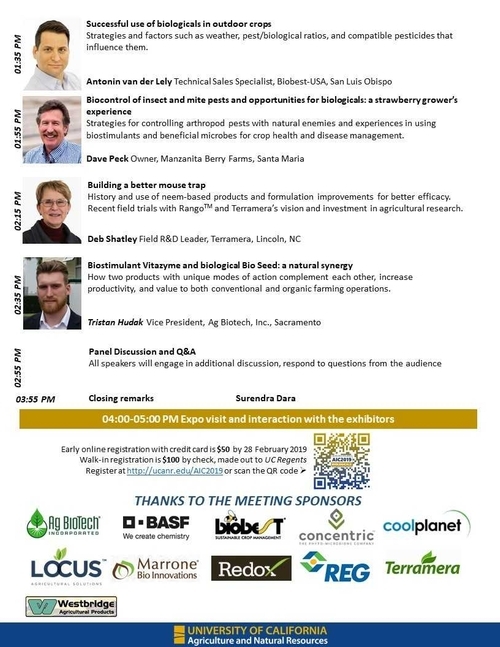 Even so, pretty stellar list of speakers - personally I'd ante up some pretty good money to catch the talk by Dave Holden on application strategies for biological controls in the field. 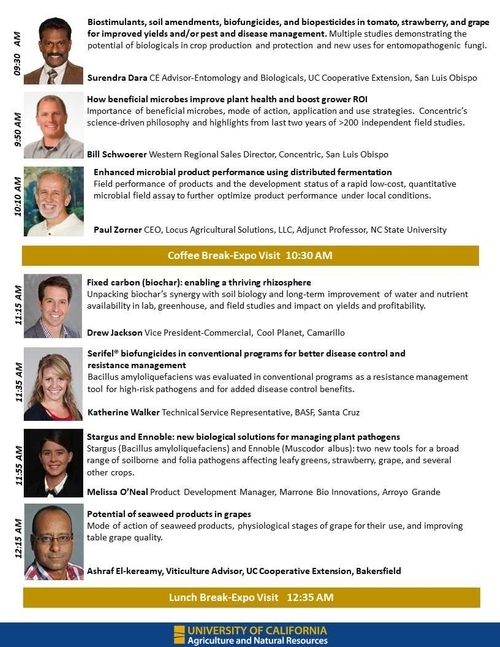 Just thumbing through a mail order catalog from a high end retailer yesterday afternoon for a Valentine's Day gift (don't forget all that this day is also our big annual strawberry production research meeting in Watsonville!) for my one and only, when my eyes lit upon the arresting photo below. Those blackberries are more than half reverted to red. How is this even possible for a STAGED photograph? 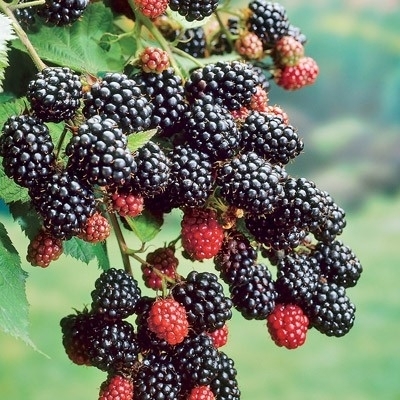 Once I settled down again, it did dawn on me that our blackberry growers and we researchers are a bit ahead of the game in insisting the blackberries we sell to our customers, who aren't necessarily picky about it, be all black, with no blemishes, discoloration or crumbliness. Perhaps we could describe it as being much as in the same way that Apple does, that we are striving to make things that people don't even know yet they need. 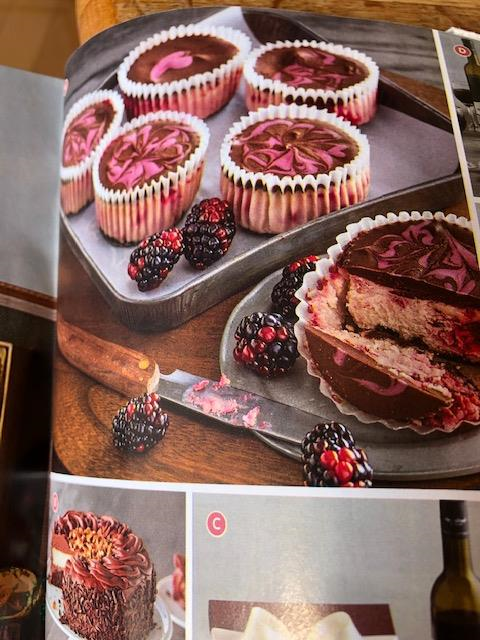 Heavily reverted blackberries depicted in high end holiday retail catalog.